More than a billion people are thought to have watched India beat Pakistan by 29 runs in the World Cup cricket semi-final in the Indian city of Mohali. Both countries largely ground to a halt during the match, which was attended by their respective prime ministers. It was the first time the two sides had played on each other's soil since the 2008 Mumbai (Bombay) attacks. The nuclear-armed neighbours' ties hit a low after the attacks, which were blamed on Pakistan-based militants. India now play Sri Lanka in the final in Mumbai on Saturday and celebrations have erupted around the country. The BBC's Soutik Biswas in Delhi says the skies are alight with fireworks and it's like a rerun of Diwali, the Hindu festival of lights. Wednesday's semi was one of most keenly anticipated contests between the countries for years. Pakistani Prime Minister Yousuf Raza Gilani was invited by his Indian counterpart, Manmohan Singh, in what is being described as "cricket diplomacy". The two leaders shook hands with both sets of players before sitting down together to watch the game. Midway through, Mr Singh hosted a dinner in honour of his guest. After the game, they were due to return to their respective capitals, Delhi and Islamabad. Indian Foreign Secretary Nirumpama Rao hailed what she called "the spirit of Mohali". "An extremely positive and encouraging spirit... has been generated as a result of today's meeting. I would like to emphasise this is re-engagement between India and Pakistan," she told a news conference during the match. Beforehand, Mr Gilani had said he hoped his visit would improve ties. "I am going to watch the match. It is too early to expect anything else," he told reporters. The meeting comes a day after India and Pakistan agreed to let their officials visit each others' countries to investigate the Mumbai attacks. The breakthrough followed talks between the two sides in Delhi. The attacks killed at least 174 people, nine of whom were the gunmen. One attacker was caught alive and has been sentenced to death. 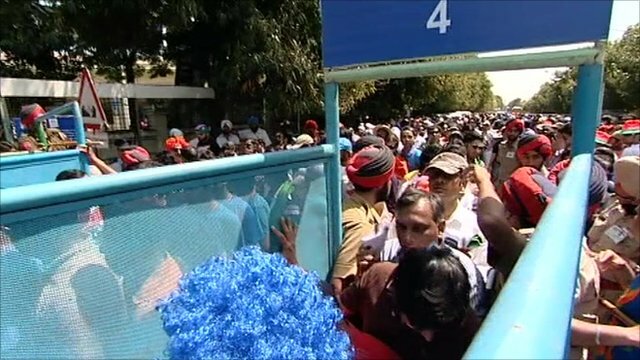 The BBC's Sanjoy Majumder in Mohali says that with only half of the stadium's 28,000 tickets open to the public, there were none to be had except on the black market. Tickets were apparently selling for up to 10 times their original value, our correspondent says. Other reports put the figure much higher. Pakistan declared a half-day holiday to allow fans to watch the match, while many offices in both countries said they would shut for the occasion. The BBC's Syed Shoaib Hasan in Karachi, Pakistan's largest city and home of cricket captain and key player Shahid Afridi, says giant screens were set up at various venues across the city. Before the match, fans hurriedly gathered at shops across the city to stock up on snacks. Everybody seemed to be bedecked in green shirts and cloaks - the colour of the Pakistani flag. Cars were also draped with flags and posters of national team members, our correspondent reports. "This is a more important event than any other event in Pakistan this year," one fan, Karachi-based fund manager Omar Ehtisham Anwar, told Reuters news agency. "There is no way I would miss even a second of this match - I will try to not even blink during the game." In India, many returned home early as well. Giant television screens were installed in markets and restaurants for people to watch the match. "We do not have any animosity towards the Pakistan team," Indian cricket fan Ravi Ansal told the AFP news agency before play began. "They are a fine team and if India go on to lose the semi-final, I will cheer for Pakistan in the final." The match was held amid tight security and authorities imposed a ban on flights over the stadium. Thousands of police and paramilitary forces were deployed around the venue. "We are leaving nothing to chance. The security will be multi-layered," local police chief GPS Bhullar told reporters. In February, the two countries agreed to resume peace talks "on all issues". Peace moves were put on hold after the 2008 attacks, although the sides have met a number of times in the past year. Pakistan's foreign minister will visit India by July to review progress in the dialogue.